On Thursday 26 November (6:30pm 8:00pm) Castlefield Gallery is pleased to be hosting On The Road, a film night celebrating the history of motorways in the north west of England, presented by Proper Magazine and Manchester Modernist Society. From 1958 the first film is a record of the opening of the Preston and Lancaster motorways and was made by Ribble Buses. 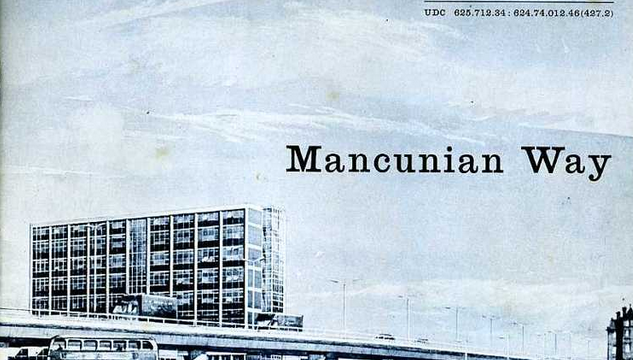 The second is from 1966, was made by The Cement and Concrete Association and is an in depth look at the design and building of our very own Mancunian Way. Finally, is a rarely seen film from 1968 made by Laing about the construction of the M6 as it makes its way through the beautiful Lune Valley in Cumbria.